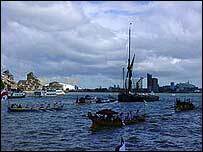 Crowds have cheered one of the largest flotillas the Thames has seen, to mark 200 years since Nelson's death. Dozens of boats carried dignitaries and descendants of those who fought at Trafalgar, from Greenwich to Whitehall. Thousands lined the river to follow the re-enactment of Admiral Lord Nelson's funeral procession. Organiser Sea Britain 2005 said the crowds were larger than anticipated. Nelson was shot dead by a French sniper at the 1805 Battle of Trafalgar. A state funeral with five days of elaborate ceremonies was held from 8 January, 1806. A spokeswoman for Sea Britain 2005 on Friday said: "It really was like recreating the funeral procession of 1806 with the number of people along the route." The funeral re-enactment began after a brief ceremony at the Painted Hall, where Admiral the Lord Boyce, the former Admiral of the Fleet, read the New Trafalgar Dispatch. "Two hundred years later we celebrate a defining moment in British history. 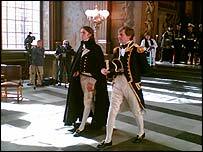 "The original dispatch said of Nelson that his memory would be 'forever dear' to his country," he said. "We celebrate the memory of a great British hero. We celebrate all the heroes of Trafalgar." The New Trafalgar Dispatch, a ceremonial document produced for the Trafalgar bicentenary, took the place of Nelson's coffin. It had been on display at The Painted Hall in Greenwich since its arrival in London on 9 September, imitating Nelson's lying in state. It was taken up river by HMS Victory's cutter, the Jubilant , and presented to St Paul's Cathedral where Nelson is buried. Boats were dressed to recreate the order and appearance of the original procession. The flotilla slowed near Tower Bridge to receive a 15-gun salute from HMS Belfast and the rowers raised their oars skywards to acknowledge the tribute. The boats made their way up river to a reception with the Princess Royal on HGS Wellington in King's Reach before finally reaching Westminster Boating Base. The Royal Navy defeated Napoleon's combined French and Spanish fleet at Trafalgar. Did you watch or take part in the flotilla? Send us your comments and experiences.